Rich Ricci has pulled Vautour out of Cheltenham’s Gold Cup – just two weeks after promising he’d run in the race or stay at home. Ricci and trainer Willie Mullins have opted to turn down a place in Cheltenham Festival’s showpiece, preferring to aim for the much less prestigious Ryanair Chase on Friday. “We’ve said in recent weeks that he hasn’t been pulling up trees in his work, but he’s been working better lately. We’ve decided now to run him in the Ryanair – he’ll be declared in an hour or so,” said Ricci, contradicting what he told a Cheltenham preview event, organised by the bookmaking company he chairs, just a fortnight ago. Enhanced odds: Get 9/1 on Min to win the Supreme Novices’ Hurdle. Click here to sign up for this offer. Nigel Twiston-Davies is bullish about the Champion Hurdle claims of stable star The New One – and if supporters who once backed him have gone cold, they don’t need to look too far back in history for a reminder of what might have been. The New One was strongly fancied for the Festival’s first day feature two years ago and looked primed to deliver until he was badly hampered, losing several lengths in the process, by the fatal fall of Our Conor. In the end he came home a very fast-finishing third, with plenty seemingly left in the tank, to the frustration of Twiston-Davies and his connections. Last season the eight-year-old gelding, who still boasts Festival form as the winner of the 2013 Neptune Investment Novices’ Hurdle, had a campaign to forget. 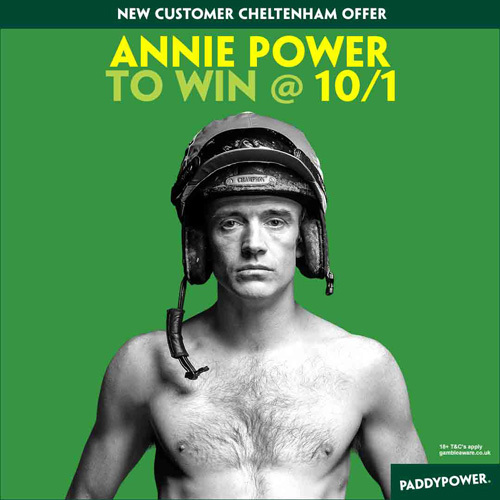 Enhanced odds: Get 10/1 on Annie Power to win Champion Hurdle. Click here to sign up for this offer. He finished fifth behind Faugheen 12 months ago but with last year’s top four all absent, this could be his chance to avenge those disappointments in a competitive and open renewal. And while he has won just one of six attempts in Grade One company since leaving the novice ranks, the Twiston-Davies stable is hitting form at the right time. Mullins’s Annie Power will likely go to post as favourite but in 15 races she’s lost twice – both at the Festival, another cause for confidence for The New One’s supporters. “The New One is the best he has been for two seasons,” said Twiston-Davies, whose son Sam will again take the ride. “With more luck in running we think he would have won two years ago, I’ve never had any doubts about that but hopefully, this is his year. The New One was second to Faugheen at Kempton over Christmas, after less than ideal preparations, and with the reigning champion absent, and the yard looking strong, hopes are high. Annie Power might have an impressive resume but she certainly owes fans for her Festival form. Two years ago she was let down by a lack of stamina in the World Hurdle but last year’s loss was one of the meeting’s most dramatic moments. Three of her stablemates — Douvan, Un De Sceaux and Faugheen — had won at short odds and she was the sure-fire last leg in many accumulators in a Mares’ Hurdle race that looked at her mercy. She was romping away from her rivals heading to the final flight, only to take off two strides early and deposit jockey Ruby Walsh on the turf. It was a fall that bookmakers claimed saved them £50 million and the collective groan echoed around the Cotswold Hills for some time. Owner Ricci and Mullins have prevaricated about paying the £20,000 supplement for the race – not that money is an issue – before finally committing, not exactly fighting talk as the horse seeks to be the first mare to win since Flakey Dove in 1994. “She’s taken on geldings before and I don’t think coming back to two miles will be any problem to her, it might actually be easier for her to race over two miles with the pace they’ll be going at,” said Mullins, who won eight Cheltenham races last year and is again favourite to end the meeting as top trainer. “She’s only had one run, but plenty of horses have won the Champion Hurdle with one run. “Two years ago she was quite a short price for the Champion Hurdle. We thought she was a Champion Hurdle horse that year, but we had others in the race and she sent in another direction. Meanwhile, Altior’s speed could cause an upset in the Festival’s first, the Sky Bet Supreme Novices’ Hurdle. But Mullins and influential owner Ricci have won the race for the past three years and have been brimming with confidence about their entry, Min, in recent weeks. But while Altior should pose some questions, there seems no-one to oppose what they have in the Racing Post Arkle Chase, which is why Douvan is a seemingly unstoppable odds-on favourite and also why perhaps smart money should go on Sizing John to take second. Meanwhile, clerk of the course Simon Claisse upgraded Cheltenham’s going description to good to soft, soft in places and expects to add more good during the opening day.